The Imagination Fair is the most amazing event ever! The Imagination Fair is more than an art show! More than a science fair! More than a tech fest! It's a space for homeschooled children of all ages to display, demonstrate and discuss the products of their creativity. The Imagination Fair was created to accommodate those products of the imagination that fall outside conventional categories of the traditional science fairs, tech fests, and art shows. It's the perfect place for kids to showcase their “outside the box” creativity! And then on the day of the event, the thing that makes the Imagination Fair awesomely awesome for the Mentors — the “5 Minute Talks” — that's when the Mentors get to sit down with the kids and learn all about their big ideas — what they created, how they created it, why they created it, what they learned creating it, what they love about what they created, what they hate about it, what they’re going to create next. These mind-blowing short talks will leave you gobsmacked by all the astonishingly inventive ingenuity and resourceful innovations of the exhibitors. But there's more! After that wonderfully magnificent conversation, each “5 Minute Mentor” places a colorful and unique “button sticker” on the Exhibitor’s participation certificate, creating a frame-worthy keepsake unique for each child. And that's not all! There's the Exhibit Catalog! Yet another keepsake to showcase all the incredible big ideas! There’s a photo of each Exhibitor or of their project with a bio or a description of their project — or both! Plus there's a photo and bio of each of all the wonderful mentors so the kids can discover what inspires all the amazing people who sat down to learn all about what inspired them! Expect to have a great time! You get to talk to kids about what they love! You'll be inspired, excited, amazed and energized! “5-Minute Mentors” are members of the community who have signed up to come and talk to Exhibitors about the products of their imaginations. These are homeschooling parents, grandparents, aunts and uncles, homeschool teachers and tutors, and other interested members of the community. Qualifications: The only requirement to volunteer as a “5-Minute Mentor” is that you be comfortable with talking to children about their big ideas. We are aware that “Mentor” is not quite the right word for this, but we couldn't come up with a better one. How do I sign up to be a “5-Minute Mentor”? Send an email telling us of your interest. Sign up by completing the online form. You'll be able to come back and add to or edit your entry — up until the Exhibit Catalog goes to the printers. To allow time for formatting, proofing and printing, please plan to have your Exhibit Catalog information to the Volunteer Event Organizers at least 2 weeks prior to the Imagination Fair, but mentor registration remains open until the Exhibit Catalog goes to the printers. It's never too late to ask! Our goal for this year is to sign up 24 “Mentors.” Please encourage your friends, family members, neighbors and colleagues to volunteer as well. The Imagination Fair does not rank projects or award ribbons. Instead, exhibitors receive a “button sticker” on their participation certificates from every “Mentor” who talks to them. You are encouraged to submit your own original design! Designs must fits on an Avery 5293 1⅔-inch round label. If you use a background color, make the background a bit larger to be sure there’s no white edge. You may use (just about) any image file format that works for you (bpg, gif, jpg, pdf, png, psd, pxm, svg, tif, etc.). You may also submit just an image suggestion or a logo and Nic will design your button sticker for you. 3. An image that represents YOU. 4. Your title (educator, mom, philosopher, scientist, engineer, etc.). Titles are entirely optional but well-chosen titles are a handy way to let the Exhibitors know a bit about who their mentors are. Our goal for the “button stickers” is to twofold: to create button stickers that are visually interesting while giving the kids a sense of who their “Mentors” are. The Imagination Fair will provide you with a sheet of 24 “button stickers” to use at the Imagination Fair. To allow time for formatting and printing, please plan to submit your original “button sticker” designs or logos at least 1 week prior to the Imagination Fair. All “5-Minute Mentors” receive a quarter-page listing in the Exhibit Catalog for a photo and brief bio about themselves. A quarter page is 5-inches wide by 1¾-inches high. To allow time for formatting, proofing and printing the Exhibit Catalog, please plan to have your information to the Volunteer Event Organizers at least 2 weeks prior to the Imagination Fair, or by Saturday, May 26, 2018. If you just need to add a couple more words, it’s probably okay. If you need to add ten more words, it just won’t fit but feel free to ask the Volunteer Event Organizers for help with editing. Please write your bio in the first person. (That is, say “I do this” instead of “Jamie does that” or “S/he does that”). This can be anything that is important to you. Maybe that's your job — you're the artistic director of a local theater or an instructor at a martial arts studio or a tutor for a reading program. Maybe that's your hobby — you're a rocketeer or a photographer or a seamstress. Maybe it's your passion — you're a philosopher or a homeschool parent or a field trip organizer. It doesn't matter what you list, as long as it matters to you! Contact information can include website, phone number, email address, mailing and/or physical address. a print-quality digital photo of you! Wider images will reduce the amount of space available for text. Your phone number, if you haven't sent it previously — unlikely we'll use it, but just in case we need to get ahold of you and email isn't working as expected. This won’t be included in the Exhibit Catalog or otherwise shared. It's just so we can reach you if email fails. Your mailing address, if you haven't sent it previously — so we can send you a thank you card! Again, this won’t be included in the Exhibit Catalog or otherwise shared. “If applicable” means that if something above doesn't apply to you, just skip it. The only thing that is “required” for the Exhibit Catalog is your name. Everything else is optional — although a brief bio and a photo are greatly appreciated! Entries may be edited for space considerations, as well as for spelling and grammar correction — so let the Volunteer Event Organizers know if you intended to use a non-standard spelling or grammatical structure. Proofs will be sent as soon as all information is received and formatting is complete. Please proofread your entry and email any corrections or changes promptly. The Exhibit Catalog will be printed in grey-scale, but you may upload a full color image — the full color image will be shown on the website. Your may keep your name badge! They make great scrapbook additions. If you prefer, you may return the lanyard and sleeve portion to the Badge Re-Use Box after the Fair ends. Because creating all the amazingness that goes into the Imagination Fair cost money, there are ads in the Exhibit Catalog. These are a great way for homeschool groups, homeschool teachers, homeschool tutors, homeschool destinations, and others in the community to connect with area homeschoolers. Discount pricing for Mentors starts at just $5, and includes website, Twitter, and Facebook exposure! You can help the Volunteer Event Organizers defray the costs of the Imagination Fair by purchasing an Exhibit Catalog Advertisement or by asking your friends, families, colleagues and neighbors to consider this unique opportunity to promote their organizations to homeschoolers and their friends and families. The Exhibit Catalog is designed to be a quality keepsake item! To allow time for formatting, proofing and printing, please plan to have your Exhibit Catalog advertisement to the Volunteer Event Organizers at least 2 weeks prior to the Imagination Fair. 10:00am – 12:30pm IMAGINATION FAIR — Display! Demonstrate! Discuss! The Volunteer Event Organizers recommend that you plan to arrive at 9:45 AM so that you have time to address any unexpected difficulties and are ready to start talking to Exhibitors at 10 AM. We have set aside a comfortable area for Mentors to wait until the Imagination Fair begins. Mentors will have to cross the Fellowship Hall to get to the Lounge! To allow all Exhibitors time and focus to set their Exhibits up on time, we ask that Mentors resist the urge to engage Exhibitors until 10 AM. Pick up your Mentor Folder as soon as you arrive at the Imagination Fair. Folders will be filed alphabetically by last name in a file box by the front door and there will also be a Volunteer Event Organizer or two at the door to help you find your folder and to review the contents with you. Inside the folder, you’ll find your Name Badge and lanyard and your “Assigned First Exhibit” number, along with a map of the Exhibit Hall so you can find your first Exhibit space, an Exhibit Catalog for you to reference and keep, and an Exhibit Bingo card for your own use. There will be a short “Quick Tips” at 9:55 AM to make sure all mentors have the most essential information they need to have a successful and enjoyable experience at the Imagination Fair. If you are also the parent of an Exhibitor, you are encouraged to join the other Mentors in the Mentor Lounge at 9:55 AM. An announcement will be made in the Fellowship Hall right before it begins. You’ll be given more “button stickers” than you can use! Specifically, you’ll receive a sheet of 24 “button stickers,” and you’ll most likely have time to talk to between 15 and 20 Exhibitors. The Volunteer Event Organizers would prefer you have a few extra “button stickers” at the end of the Imagination Fair than to find yourself short a couple of “button sticker” or two! In the unlikely event you do run out of “button stickers,” find Nic Rosenau for a solution! She’ll have a plan. You may keep your extra “button stickers” and have some fun with them after the Fair! Each Mentor will be assigned a starting Exhibit. This is to help prevent clumping and jams by spreading the Mentors out evenly around the room at the start of the Imagination Fair. Your Assigned First Exhibit will be clearly marked on your Mentor Folder and on the Exhibit Hall map inside your Folder. If you can’t find your first Exhibit, ask a Volunteer Event Organizers for help — or just choose a likely place to start. Exhibits can be anything! 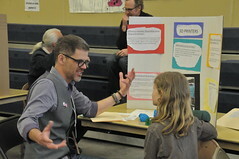 The Imagination Fair was created to accommodate those creations that fall outside conventional categories of the traditional science fairs, tech fests, and art shows, including ideas that either don't fit into the traditional art show categories or must be distorted to qualify as a traditional science fair project. Board games and video games, animations, novels, short stories and comic books, contraptions, electronics, robots, rockets and go-karts, models, architecture, dioramas and cardboard creations, clothing and costumes, LEGO® masterpieces and MINDSTORMS® marvels, and other products of the imagination. The Imagination Fair is the perfect place to showcase your “outside the box” creativity! Of course, the Imagination Fair also welcomes traditional artistic endeavors and scientific explorations! Most Mentors spend about 5 minutes with each Exhibitor they meet. You do not need to time your talks! Having a general sense of the time you are spending with each Exhibitor is enough. 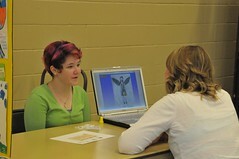 Mentors are asked to visit as many exhibits as time allows. Based on past Imagination Fairs, most mentors can expect to visit about 20 exhibits. Mentors are asked to be aware of which Exhibitors are in need of more visits so that no Exhibitor feels ignored. The focus of the Imagination Fair is on the process of creation rather than the products, but you may connect with Exhibitors in any way that feels right for that particular conversation. Sometimes an Exhibitor needs to take a short break. If you arrive at an Exhibit without an Exhibitor, simply move to the next Exhibit. You can trust that the next available Mentor will talk to any missing Exhibitors as soon as they returns to the Exhibit. You may even find that you circle back around to that Exhibit! In the same vein, if you find that the next Exhibitor is already engaged in a conversation with a Mentor, simply move to the next Exhibit. You can trust that the next Mentor in line will pick up that Exhibitors when the current Mentor finishes. This keeps the Mentors moving and prevents pile ups. Again, you may find that you circle back around to that Exhibit! Exhibit Bingo is an original Exhibitor idea to help younger kids get involved — but we also use it to help Mentors keep track of which Exhibits they’ve visited! Exhibitors you visit will stamp your Bingo Card in the space for their Exhibit number. You can even show your Bingo card at the Prize table and receive a small prize for every five Exhibits you visit! If you have any small prizes to donate for Exhibit Bingo use, let the Volunteer Event Organizers know via email. You may drop the prizes off at a Make-It-Happen gathering or just bring them along with you to the Imagination Fair. Please be aware that Peace Lutheran Church does not have public WiFi. Please plan to join Exhibitors, other Mentors, Volunteers and their friends and families for lunch after the Imagination Fair. The Imagination Fair is serious about inclusivity! The Imagination Fair does not discriminate based on race, color, national origin, ancestry, age, gender, familial status, marital status, neurodiversity, sexual orientation, gender identity and expression, disability or handicap, neurodiversity, veteran status, economic status, religion, or homeschooling philosophy or style. Mentors are not expected to attend Make-It-Happen Gatherings or otherwise participate in event organizing, but those who are interested are welcome to join the group!